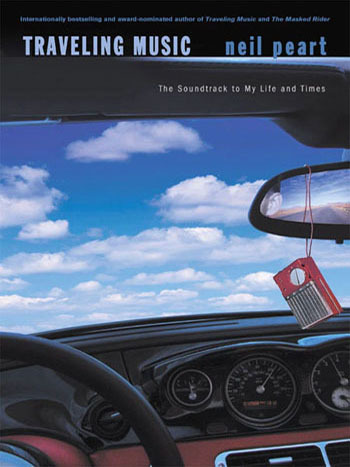 Neil Peart's "Traveling Music: Playing Back the Soundtrack to My Life and Times"
Travelling Music: Neil Peart's third publicly published book, Traveling Music: Playing Back the Soundtrack to My Life and Times, is now available in both paperback and hardback editions. Neil Peart decided to drive his BMW Z-8 automobile from L.A. to Big Bend National Park, in Southwest Texas. As he sped along "between the gas-gulping SUVs and asthmatic Japanese compacts clumping in the left lane, and the roaring, straining semis in the right," he acted as his own DJ, lining up the CDs chronologically and according to his possible moods. "Not only did the music I listened to accompany my journey, but it also took me on sidetrips, through memory and fractals of associations, threads reaching back through my whole life in ways I had forgotten, or had never suspected...Sifting through those decades and those memories, I realized that I wasn’t interested in recounting the facts of my life in purely autobiographical terms, but rather...in trying to unweave the fabric of my life and times. As one who was never much interested in looking back, because always too busy moving forward, I found that once I opened those doors to the past, I became fascinated with the times and their effect on me. The songs and the stories I had taken for granted suddenly had a resonance that had clearly echoed down the corridors of my entire life, and I felt a thrill of recognition, and the sense of a kind of adventure. A travel story, but not so much about places, but about music and memories." "Contents Under Pressure celebrates the 30th anniversary of Canada's beloved Rush, the hard-hitting, progressive rock band known for such classics as "Working Man," "Closer to the Heart," "The Spirit of Radio," "Tom Sawyer," "New World Man," "Roll the Bones" and "Ghost Rider." 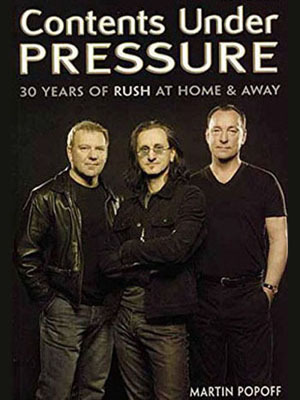 In original interviews with Geddy Lee, Alex Lifeson and Neil Peart, author Martin Popoff considers each of Rush's albums and tours. He elicits fresh insights on the writing and recording process, as well as musings on the grinds and glories of touring. Along the way, Popoff examines, with the band, nearly every song in the band's vast catalogue. This book also features 270 photos by official band photographer Andrew MacNaughtan and others - candid, rare, and of utmost quality, they help make Contents Under Pressure an essential piece of Rush history."